"Relates to the joys, troubles and fears, the unavoidable questions people have today." 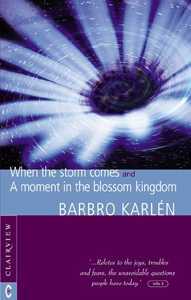 Written between the ages of 10 and 12, Barbro Karlén's two short fiction works are a remarkable literary and visionary feat. The young Barbro writes with the prophetic gifts and maturity of a seer, warning humanity of the dire consequences of ignoring the needs of nature, the earth and the heavens. In "When the Storm Comes" she foretold, years before the prevalence of ecological ideas, the catastrophic results of mistreating the earth. Today, with the increasing changes in weather patterns, her warnings read like truly inspired prophecies. But what distinguishes "When the Storms Comes" from other revelatory works is its beauty and parable-like, refined literary form. The second piece, "A Journey to the Blossom Kingdom", is a wonderful, imaginative journey into other worlds, presented in inspired pictures of soul and spirit. The Blossom Goddess takes Barbro into realms of being where her inner nature becomes transparent to those around her. Led further by angel-like entities, she visits many distant places, including grey and dark worlds of torment. The young girl learns many lessons and enters into delightful spiritual and philosophical discussions with her host. Both works provide a feast of lively and instructive images; a glimpse into an exceptionally gifted, visionary child's secret world filled with love and humour.